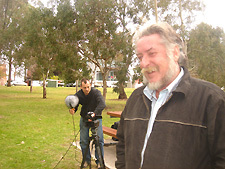 On our last day in Adelaide we had a meeting with Frog Films, to do some filming for an Australian TV programme. The filming took about an hour, where we had the opportunity to talk about our trip and why we chose to do it on recumbent bicycles. 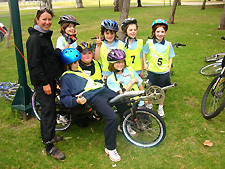 Just as we had finished filming a group of school kids on bikes arrived with two adult minders – it was a regular school day and they were on their ‘bike ed’ class – part of every 11-12 year old’s school curriculum here in South Australia, where they are taught about road safety and good cycling practices. We were impressed! Also in Adelaide we had been booked in for a radio interview with ABC, on a popular chat show hosted by Peter Goers. Unfortunately at the last minute we were bumped off schedule when the Australian soccer team (‘socceroos’) managed to get through to the next round in the World Cup and they decided to do a last-minute special on it!